that come standard with the Store Locator. Want to request a modification? Please, contact our Support Team and describe the tweaks you need! Store Locator script is mobile-optimized and allows flawless shopping experience across a wide range of end-user devices (smartphones, tablets, PC, Mac, etc.) You can also switch color themes to match your website branding. *For a limited time only get the best deal ever on the market! 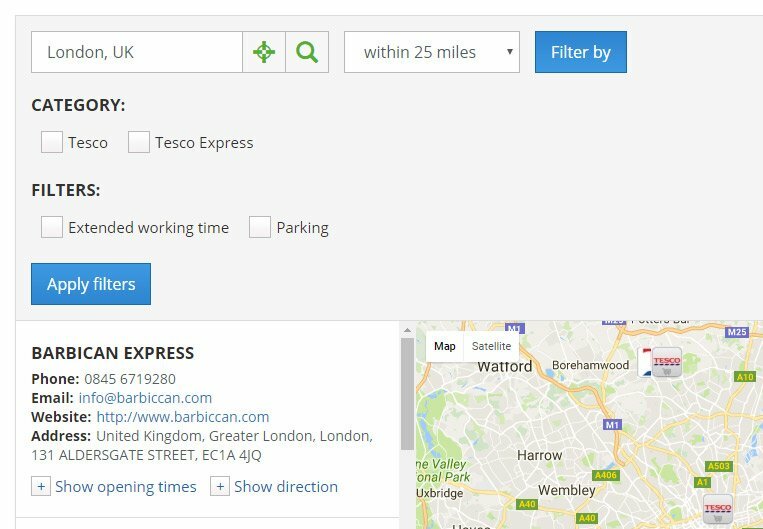 You can create different kinds of filters to narrow down the search to specific customer requirements such as "Parking", "Extended working time", etc. Then go to your Stores and mark the filters that apply to each store. 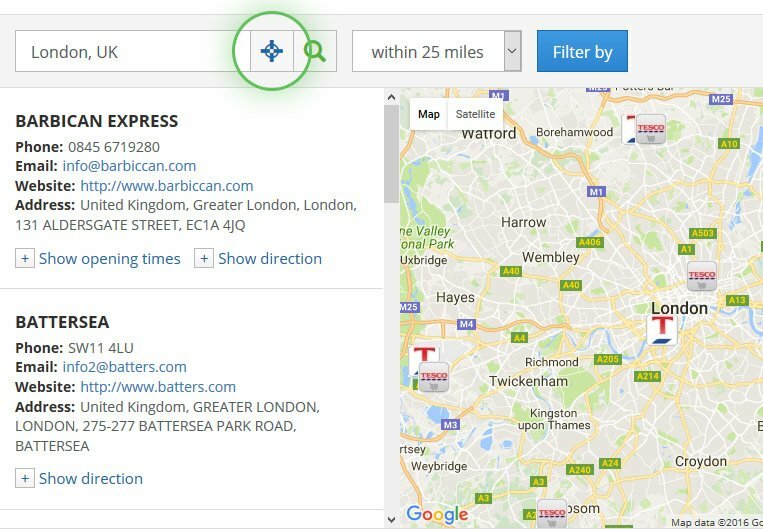 Your website visitors can easily find stores in their close proximity or a specific area using the distance dropdown menu on the front-end. Admins can change the measurement unit (miles, kilometers) as per the regional specifics. The built-in Google Marker feature allows back-end users to add custom pins (e.g. store logo, first letter, etc.) 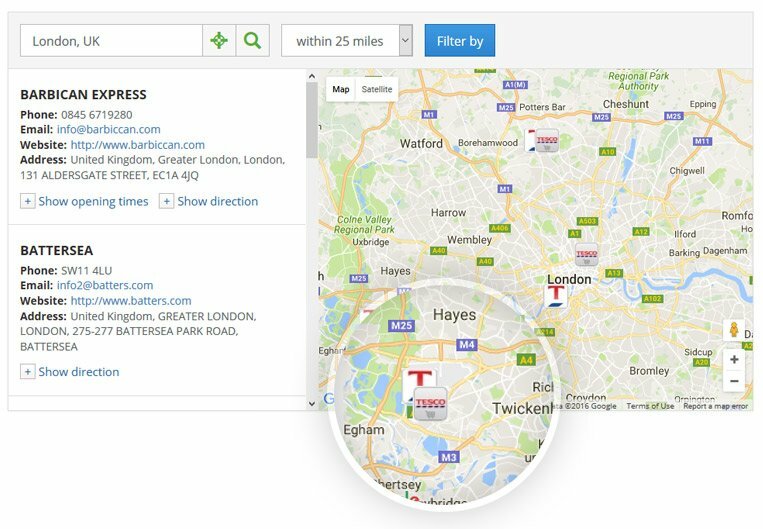 for each Store Category, so that customers can detect them effortlessly on the map. With this Google Maps Store Locator you can add a custom image or logo for each store or business location. Just upload the file and it will appear in the upper left corner of the respective store profile, next to the contact details. 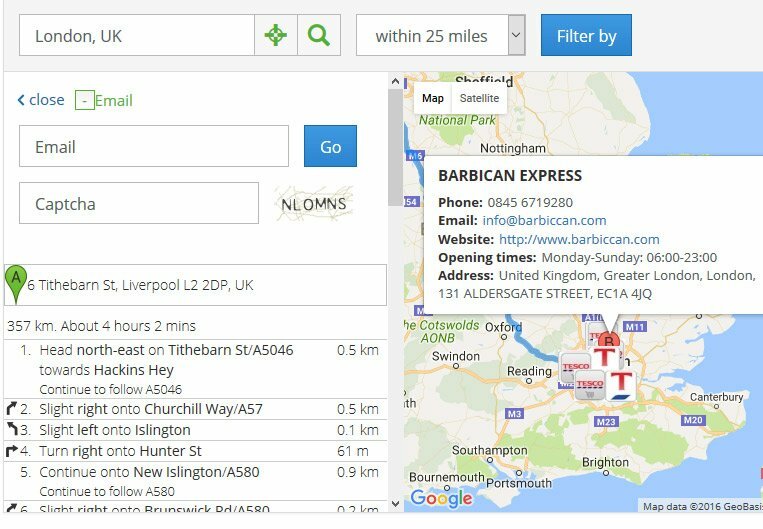 Zip Code locator and automatic coordinates input; the Store Locator script automatically finds associated geographic coordinates (latitude and longitude) by using the street address or the zip code. 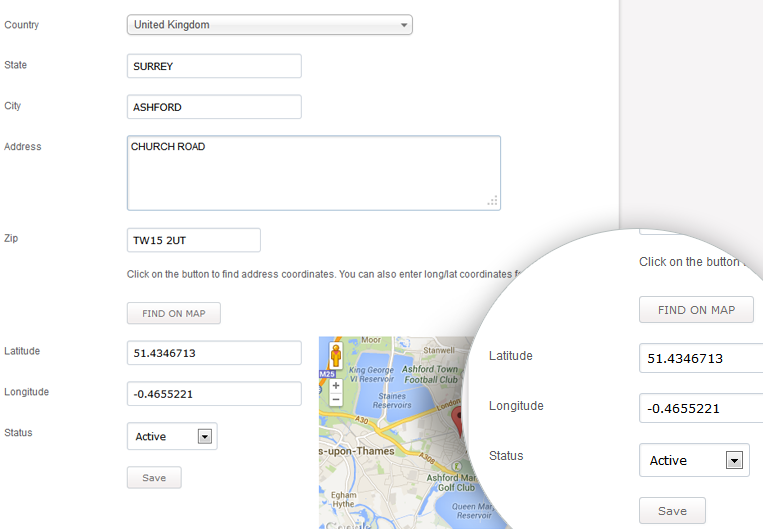 You can find coordinates manually or use 'Get coordinates' feature in the stores list to automatically find coordinates. 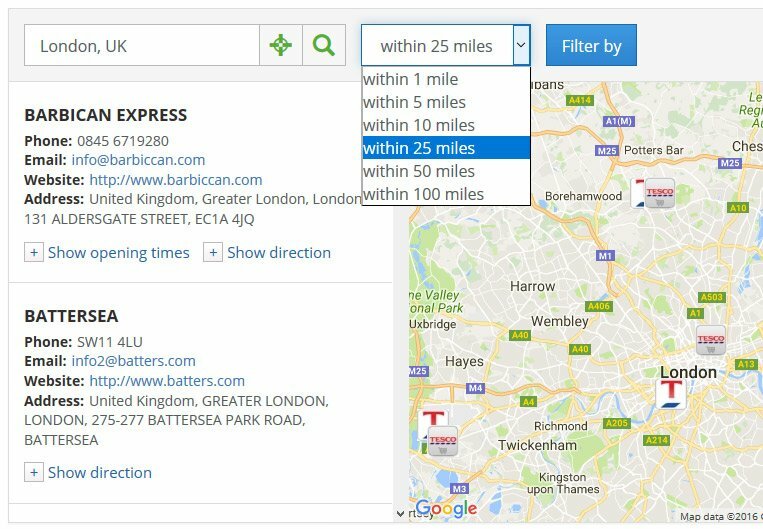 The built-in Geolocation lookup tool helps users to find their current position so they do not have to type their address to get directions to the nearest store. 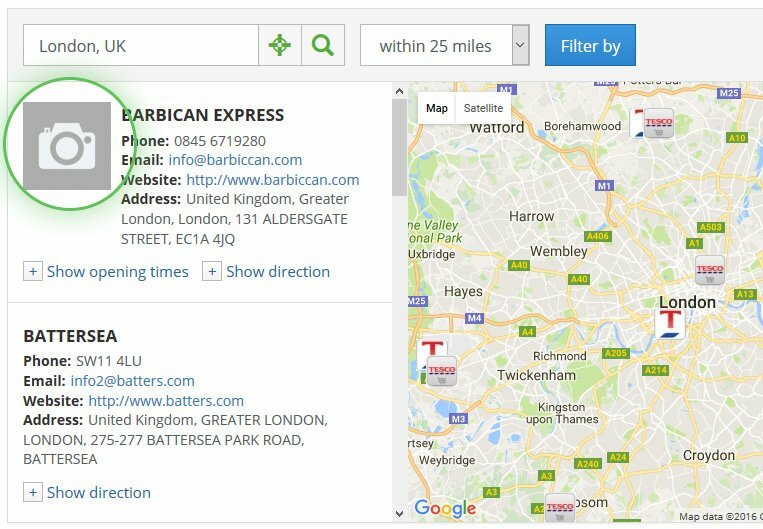 Just click on the icon next to the address field to find your way! 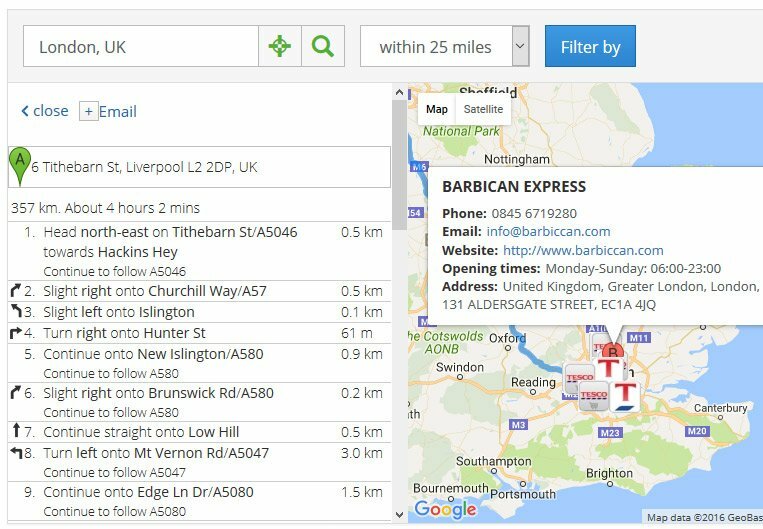 With our Google Maps Store Locator you can import or export stores using a CSV file. 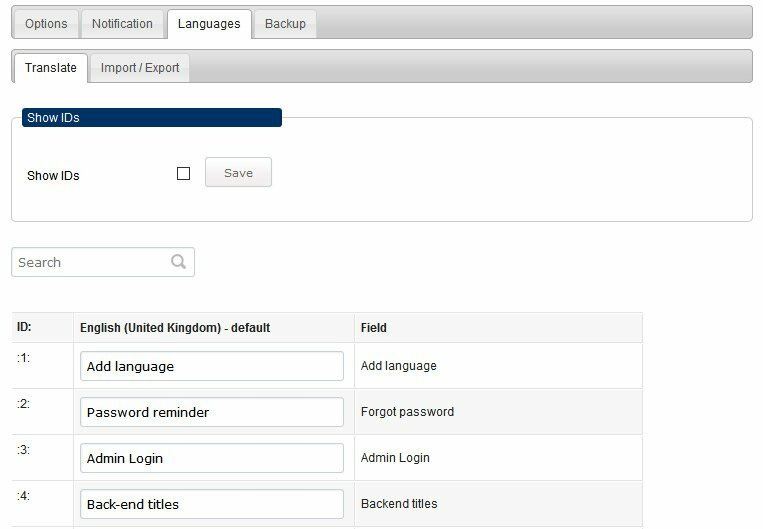 Use the Stores menu in the Admin to import and export stores and follow our detailed instructions. 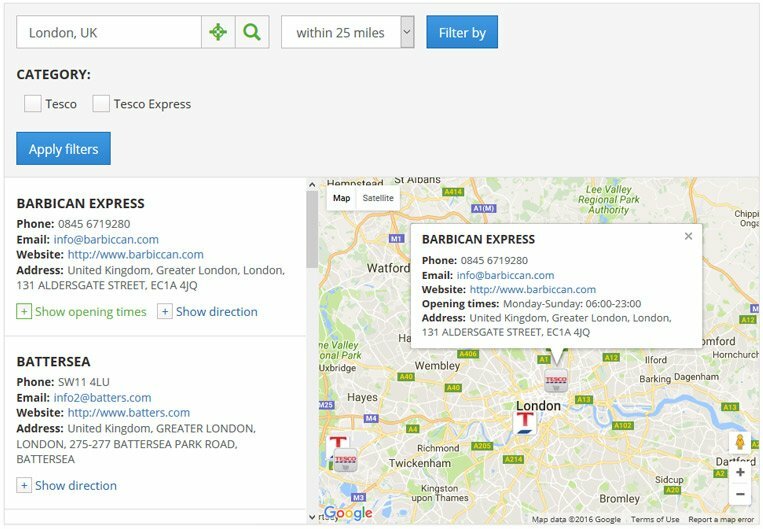 With the Store Locator PHP script, your customers can get automatic Google Maps directions by entering their current address. The suggested route to the selected store or business location will appear on the map. After retrieving the directions from their current address to the selected store, users can enter their email and receive a copy of the route which they can print out or forward to other people. 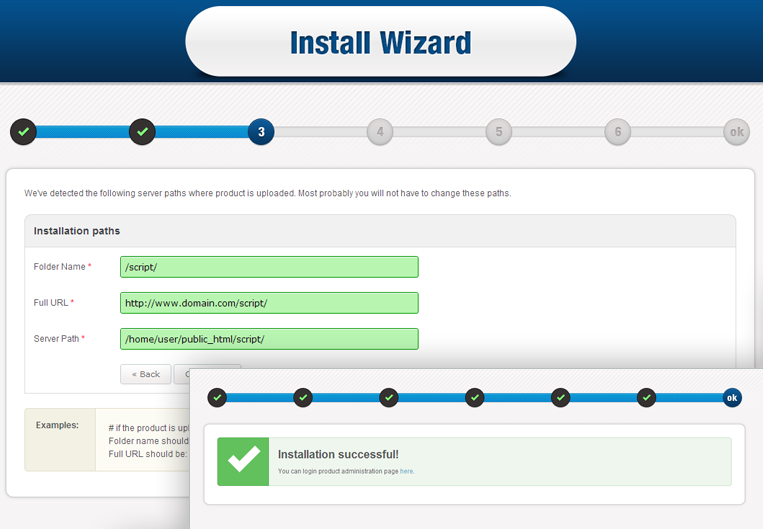 Translate the Store Locator PHP script into any other language than the default one (English). The simple language module allows users to do this using unique text IDs and CSV files. 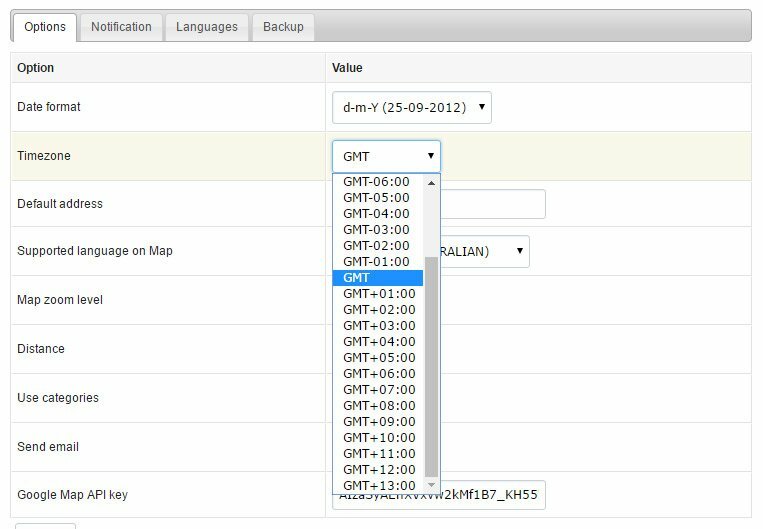 In the General options menu, users can specify their preferred time zone, date format, map soom level, and other important settings such as default address, distance measurement unit, etc. Admins, with full access to the system, and Editors who can only access Stores and Categories. Our PHP Framework is specially developed for high-rate performance and works great even with heavy databases. 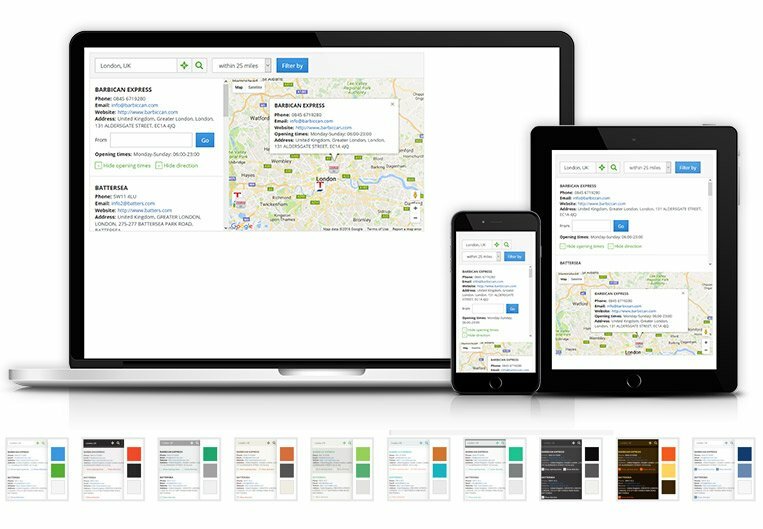 Watch a video demonstration of one of our scripts which has 1 million listings and 8 million records! Using the One AdmiN feature you can set up a single login screen for multiple PHPjabbers' scripts. 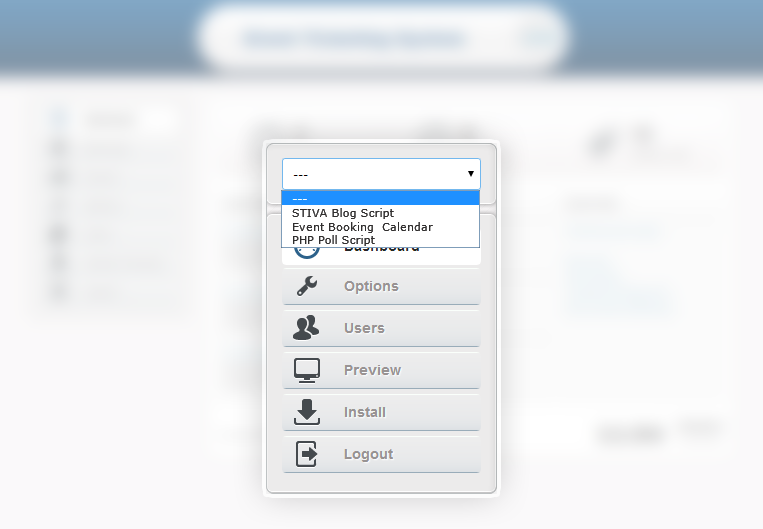 Once enabled, you can use a drop-down menu to switch between the script admins. Read more about One admiN. If you are a web developer, you may want to modify the Store Locator script yourself. With the Developer Licence you receive access to the script source code and a guide for our framework. Read more about our framework! We can also make all kinds of custom modifications upon request! Store Locator script comes with the following special features: Installation Wizard & Cross Domain Integration, High Performance Protected Against SQL Injections PHP Framework, One admiN Module, Translation Module & Backup Tool, User Permissions & Encrypted Passwords, Clean PHP Code & Developer Licence. You may also benefit from our extra services: FREE Installation & Support, Free Updates, Remote Hosting, Payment Gateways Integration, Web SMS, Custom Modifications, Extended Licence Program.